It took my daughter-in-law, Melissa, nearly two years working on the GSA (General Services Administration) paperwork and government documents. (GSA is an independent agency of the United States government.) On August 23rd, 2011 we were notified that we were granted a contract. That meant that we could approach Federal Governmental agencies and pitch our product. Melissa, Joyce and I attended and exhibited our Professional Go Treads at many military and government shows and small business symposiums. We had a great response from the military personnel who stopped at our booth to watch our demonstration. One retired Marine Officer commented that if the Marines had Go Treads back when he was in, “we wouldn’t have lost some of our men”. That comment struck me, I realized that the tool that I designed to help folks get unstuck was more than that; Go Treads can be used to save lives. Maybe that is the reason I was driven to make our traction tool in the first place. Melissa and I went up to the Detroit area to present Go Treads to TACOM (Tactical Armament COMmand) a number of times. We even did a video for them to demonstrate how one warfighter could get a dual axle Army truck out of a stuck situation in less than two minutes gotreads.com/military. For seven years we have been trying to equip our military with this tool, but as of yet only a handful of our deployed warfighters have them in their vehicles. We anxiously wait to hear how Go Treads have helped our deployed men and women around the world. In 2015, we moved our production from Kansas City, Missouri to Ferguson Production in McPherson, Kansas. The biggest reason for this was the distance, we moved from a facility 200 miles away to a facility just 20 miles from us. It made sense to have a custom molder down the road from us rather than a four-hour drive away. Ferguson Production is an ISO 9001 Certified production facility, which means everything they make is “traceable” from raw materials, to production, to assembly, to warehousing, to shipping. That means that if we were to find a flaw in a Go Treads tool, they can track it down to date and time it was made and who was running the machine. Fortunately, they have such tight quality control measures, we never had problems with the thousands of tools they made for us. 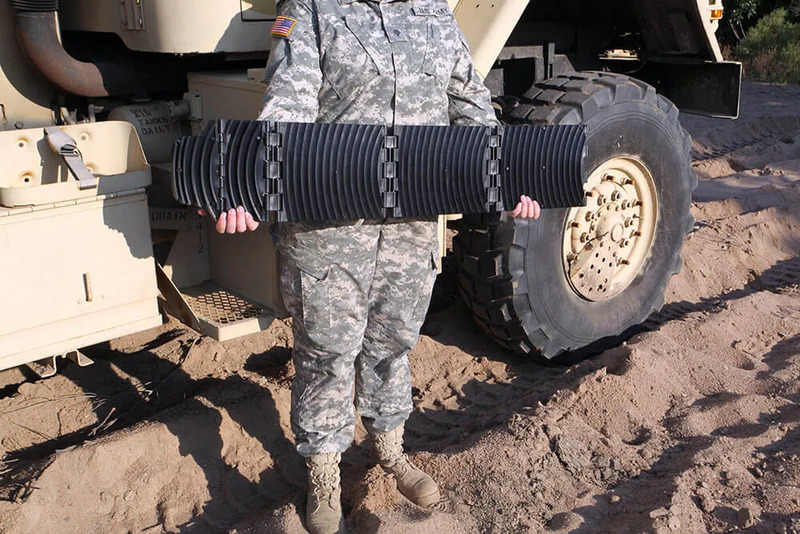 In the military video we did for TACOM you will notice that we used our standard three section Professional Go Treads. The video demonstrates that the truck’s tire just cleared the last section before coming out of the hole. It was from that demonstration we realized that our military Go Treads needed to be a little longer. We had already agreed on a set price with GSA and DLA but the words of that retired Marine came to mind, and we all decided to make the military tool four sections long at the three-section price. We want our warfighters to come home safely and we will do what we can to accomplish that. Because we didn’t quit, our family finds ourselves not only providing a reliable tool to folks going about in their daily lives, but we are potentially helping our military service personal come home safely. In keeping with Aaron’s plan to use the internet as our major marketing outlet, he and his wife Tammy set us up on Amazon. Selling on Amazon proved to be a good thing for us and as our sales grew from that effort, we went with the extra expense and offered Go Treads on Amazon Prime. We saw a noticeable increase in sales immediately after implementing that. We have found that we have a better connection with our customers through the use of the internet compared to the traditional brick and mortar retail stores. That is what we want. We want to connect with our customers, so we can better serve them. We seek their opinions and suggestions as to how better serve them. Yes, we are in business to make a profit but more importantly, we understand that if we develop closely connected relationships with our customers, the profit automatically comes. We depend on these relationships to advertise for us – word-of-mouth advertising. Over the years we have been able to get to know so many good folks from all walks of life. It is exciting to meet them doing sales calls, at Expos, trade shows and through email. Each one has a special life story to share. Its way better than slouching in a soft chair and watching TV. These are real people with real-life experiences to share. If only we would take time to get to know those around us, it would expand our horizons. We are very thankful that through our little business we can meet and get to know literally thousands of great folks. It is a wonderful thing! That is why we print, fold and personally sign thank you notes to our customers. We include a personally signed Thank You card in every box of Go Treads we send out. Our family is here to serve our customers the best we can. We also want our tools to be a help when they get stuck. Our business model may not be as profitable as it could be; that is, if we were mass marketing Go Treads. We try to offer a high-quality tool at a reasonable price. To do that we chose to sell directly to the end user and through personally selected dealers. We do this without all of the “middlemen”, which just increases the price to the customer. This business model seems to be a win-win for us and our customers. Show kindness and care about people even though you may occasionally get misunderstood and kicked in the pants. In the long run, you will positively influence countless folks in your lifetime. Learn that no matter how big the wall; go through it, around it, over it or under it. Be resolved to never give up! It can be done… You can do it! For years Aaron kept asking me if he could market Go Treads to the off-road enthusiasts and for years, I told him that the market is too small compared to the fleet and military market I was working on. Finally, in December 2015, I agreed to let him take Go Treads to Overland Expo West to see what he could do. Well, in those three days at that Expo, he sold out. He proved me wrong, there was a market with the off-road folks. Since then, he took Go Treads to all the Overland Expos (West & East). He kept taking more and more to the Expos and consistently sold out each time. I’ve learned to pay closer attention to those around me who are trying to help. So often I am so focused on my agenda, I tend to tune out good advice I hear. As a result of Aaron proving the off-road market, I recognized that perhaps Aaron has better insights on our business future than this old guy. That’s why, with the permission of the shareholders, we appointed Aaron as our Vice President. Pay attention to those who are genuinely trying to help you. In October 2018, I went to Sydney, Australia to help our new distributor, Mark, debut his small family business selling Go Treads at the Sydney 4 Wheel Drive Show. I must have shaken hands with 2,500 to 3,000 folks. It was an awesome experience. The people were so warm and friendly. All of them made me feel part of their family. We almost sold out at that show, too. Two days after getting back home from Sydney, Joyce and I headed for the Rendezvous in the Ozarks at Byrd’s Adventure Center in the Ozark Mountains of Arkansas. Then two weeks later the family headed to the Overland Expo East in North Carolina. These three, family friendly, 4-WD and Overland shows were the first ones I attended because up to then, Aaron and his family did them. The folks I met here at the US shows were as pleasant to talk to as the Australian bunch. These off-road people are some of the nicest folks you would want to meet. Our family enjoys being around them. While chasing your dream; be it starting a business, building a strong family, volunteer work, ministry, career, or whatever – you will get frustrated with the challenges but take time to enjoy the moments of fulfillment along the way. That’s what makes it all worthwhile. We established Pinto, Inc. in 1991 so our children were involved in the business when they were young as you saw in the pictures at the beginning of this story. Now those kids are married with kids. Now, those kids (our grandchildren) are getting involved in the business. They enjoy coming to pack the boxes to ship out to our website customers and stuffing the Thank You zip-lock pouches we put in each box shipped out. Our third-generation helpers during their summer break from school, Xander and Josiah. Picture was taken in the same kitchen where we had our first pre-production planning meeting 27 years ago. This Go Treads story summarizes the first twenty-seven years of Pinto, Inc. There is more to come. We are eager to tell but we need to wait until around the time of the Overland Expo West – Flagstaff, Arizona – May 17-19, 2019. There are two, possibly more, very exciting things in the works. Until then, we hope that our story inspires you to take a step of faith and go after your dream. Concerning your dream, say this to yourself and believe you can do it: “If it is to be, it’s up to me.” Chase your dream and never, Never, NEVER give up!! !